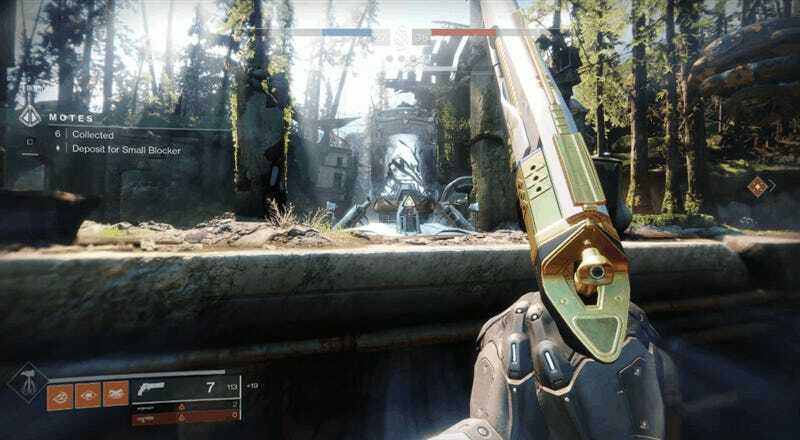 Destiny 2’s Forsaken expansion introduces a lot of new stuff to the game, but the most significant addition is a new hybrid competitive/cooperative mode called Gambit. It’s a hell of a lot of fun, once you know what you’re doing. Note: This article originally ran on 9/04/2018. I’m bumping it up with some new tips after spending a week playing Gambit in the finished game. Over the last week, I’ve played a bunch of Gambit. I’ve won, and I’ve lost, and in the process, I’ve learned how the game works, and how much of a difference it makes when everyone on your team knows what they’re doing. In the interest of helping possible future teammates know what they’re doing, here’s a breakdown of how Gambit works, along with some tips on how to play well. The Drifter is your host and play-caller. He will also gladly show you his collection of Phish bootlegs. Start by learning the basics. 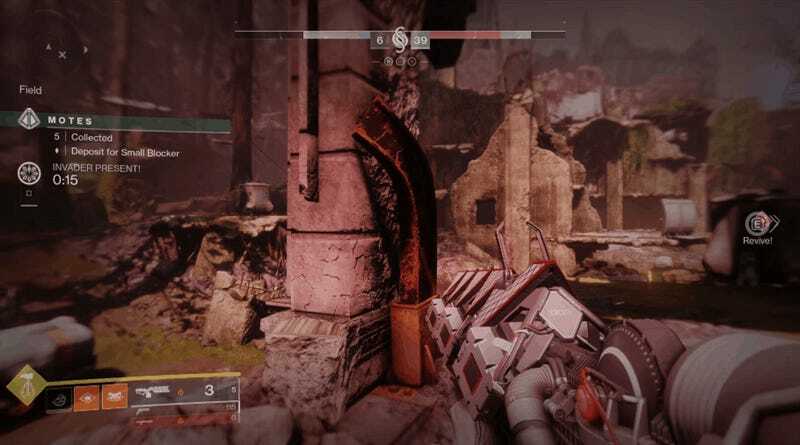 In Gambit, two teams of four compete in parallel, separate arenas. Each team is trying to be the first to summon and kill a big boss, known as a Primeval. Kill your Primeval, and you win the round. A full game of Gambit consists of up to three rounds, and whoever wins two wins the game. On each subsequent round, the enemies you fight get progressively tougher. Each enemy you kill drops a certain number of white pyramidal Motes, which can be collected and then Banked at a bank in the center of the map. If you get killed while carrying a bunch of Motes, you lose them for good, so the more Motes you have, the more careful you need to be. When a team has banked a total of 75 motes, they summon their Primeval, after which their objective shifts from Mote-collection to Primeval-slaying. So, it’s best to think of each Gambit round as two phases: the Mote phase and the Primeval phase. It really is the Besto. A round or Gambit requires more than just quickly banking Motes before killing a Primeval. Your team can also affect the other team’s arena in a couple different ways. If you bank a lot of motes at once, you can temporarily shut down the other team’s bank and summon a Blocker, which is a tough enemy they have to kill before they can bank more Motes. At various points your team can also send a single player through a portal to the other side, where they become an Invader. Invaders have a limited amount of time to hunt down and kill players on the other side. If you invade the opposing team’s arena during the Motes phase, you can chase down players with a lot of Motes and kill them, which causes them to lose the Motes. If you invade during the Primeval phase, each player-kill you get heals the other team’s Primeval and makes it that much harder for them to win. Die as an Invader or run out of time, and you return to your side. Invasion is a crucial part of Gambit, and a good Invader can make the difference between winning and losing. If you want to do well at Gambit, you’re going to have to communicate with your team. Ideally that means playing with friends or clanmates, but it could also mean sucking it up and hopping into team chat if you’re playing with randoms. There are so many things you’ll want to be able to quickly call out—Mote count, Invader location, Primeval strategy—and the team that talks together, wins together. Know how many Motes everything costs. It’s easy to just run around, grabbing and banking Motes all willy-nilly. That’s a good way to lose. Try instead to think of Motes in terms of what they can get you, and try to coordinate with your team to make sure you’re banking Motes efficiently. And of course, at 75 Motes your Primeval shows up. Once you have your Primeval, your opponents will regularly start getting invasion portals on their side, so be prepared to fight off some Invaders! During the Motes phase, you should always be summoning some sort of Blocker when you bank. If you’re carrying around four Motes, you should try to get one more before banking. If you get up to eight, call out to your team to leave you two so that you can the 10 required for a medium Blocker. That’ll slow down the other team a lot more than a small one would. It’s important to have everyone banking Motes with the precise number to get a Blocker, and ideally coordinating their banking so that all the Blockers appear at once. That’s doubly important at the start of a round. With efficient play, smart banking, and a skilled Invader, a coordinated team can quickly pull way ahead. Here are a couple of examples of bad and good ways to handle banking Motes. After the first couple of waves, let’s say a team collects 25 total motes. A poorly organized team would have their four players carrying 9, 8, 6, and 2 Motes respectively. That’s an inefficient distribution. If they banked their Motes, they would send across three small blockers (pretty easy for the other team to dispatch) and open the Invasion portal. By the time their Invader got into the other team’s arena, that team would probably have killed the small Blockers, deposited any Motes they were carrying, and would be ready to counter the Invader. A better-organized team would approach things differently. They’d have players call out what they needed so that those 25 Motes were distributed more productively. When it came time to bank, two players would be carrying 10 motes, and one would be carrying five. They’d all bank at the same time, opening the portal while sending over two medium blockers and a small blocker. Those Blockers would require a bit of work to clear out, which would leave the other team vulnerable to getting killed and losing their Motes. With the Portal open, you’d be ready to send your Invader over to do just that. Know how to read the screen. 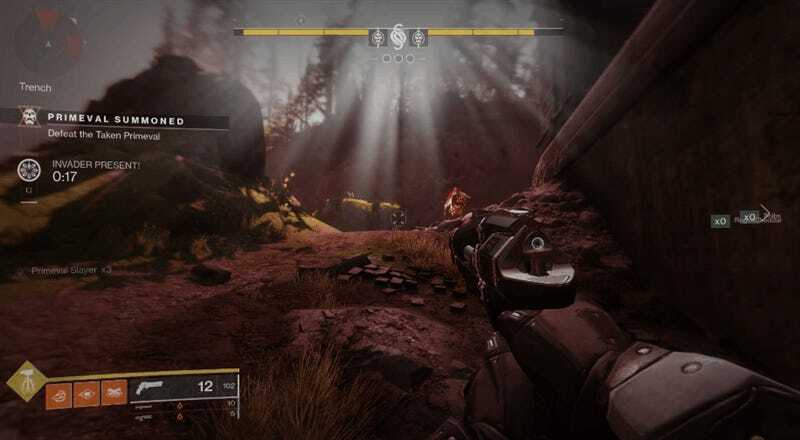 You’ll have to quickly process a lot of on-screen information in a game of Gambit, so it’s good to understand the most important UI elements going in. Here are some things you might. First, let’s go over the scoring bars at the top of your screen. The numbers in the center indicate how many Motes each team has banked. The opposing team has banked five motes, and my team hasn’t banked any. That means they’ve sent us one small Blocker, which should be pretty easy to deal with. Your team’s score is on the left in blue, and the other team’s score is on the right. The hatch marks indicate the thresholds upon which your team will be able to summon a portal (25 Motes and 50 Motes), and should give you a sense of what your team should be doing at any given moment. As soon as your progress bar passes one of those thresholds, it’s generally a good idea for everyone to go bank their Motes so that you can send someone through. Here, you can see that the other team has more banked 35 motes to my team’s 28, but we’re both about halfway between our first and second portal summon. There’s also a small indicator that comes up to show when the other team has a live portal on their side, which means I should prepare for an Invader. Because you can see the other team’s progress, you can coordinate when to bank. As I said earlier, a good approach is to do a coordinated bank that sends over a bunch of tough Blockers at once. It’s even better if you can do that while your opponents’ progress bar is mostly grey, because that means they’re still running around with Motes and will be vulnerable to your invader. The Blockers will keep them from banking their Motes, so your Invader will have the opportunity to set them way back. …which should help you prioritize your targets. In the invasion pictured above, my first target should be Atlas, who is carrying eight motes. After him comes NastyMan, then whoever else I can get. The more Motes I can cost the other team, the farther ahead I’ll put my team. The last thing you’ll want to be sure you understand is the Primeval health bar, though that’s pretty straightforward. When you’ve banked 75 Motes, your progress bar will be replaced with your Primeval’s yellow health bar. You can see your health on the left, and your opponent’s Primeval health on the right. Get yours empty first to win. Our opponents already have their Primeval up, but we’re still banking Motes. They also have a Portal and are waiting to send us an Invader. Not a good situation. If you have a handle on the big-picture strategy, coordinate your banks, and talk to your team, you should be in good shape. Pick one or two players to be your designated Invader. It’s helpful to pick roles ahead of time: who’s going to be designated Invader, and who’s going to stay behind? One of the best things about Gambit is that it lets players who like PvP go fight other players, while players who like PvE can focus on that. Our brave Invader heads off to war. I’ve played on teams where one guy was happy to constantly go across, and on teams where two players rotated invading. Rotation can be good for a number of reasons, partly because it gives players more time between invasions, which makes it easier for each Invader to build up their super and get heavy ammo. It also means that the opposing team will have to deal with multiple invasion strategies—maybe one of your Invaders snipes while the other leaps in with a grenade launcher—so they’ll have a harder time getting used to your tactics. Two can play at that game, Mr. Sleeper Simulant. When you’re invaded, drop everything until it’s dealt with. The moment you hear the alert that the other team has sent through an Invader, you should stop what you’re doing and go into counter-invasion mode. If you see their character’s telltale red glow, call out their location to your team. If you have a sniper or other long-range weapon, get ready to use it. Under no circumstances should you continue fighting against regular enemies or the Primeval, because there’s nothing an Invader likes more than picking off players who are distracted by whatever they were doing when the invasion began. Unless your Primeval is literally seconds from death as you’re invaded, you should drop what you’re doing until the Invader has been banished. Your power level matters, so don’t use low-level gear. It’s easy to miss a small note in the Gambit activity description: “PvP level advantages enabled.” That means that whenever you’re taking on another player, your respective power levels actually affect how much damage you’re doing. It’s therefore best to load in with infused, current-power weapons, as opposed to using year-one stuff you haven’t brought up. You’ll do a lot better when it’s time to fight off an invader (or invade yourself). Don’t underestimate how many advantages an Invader has. 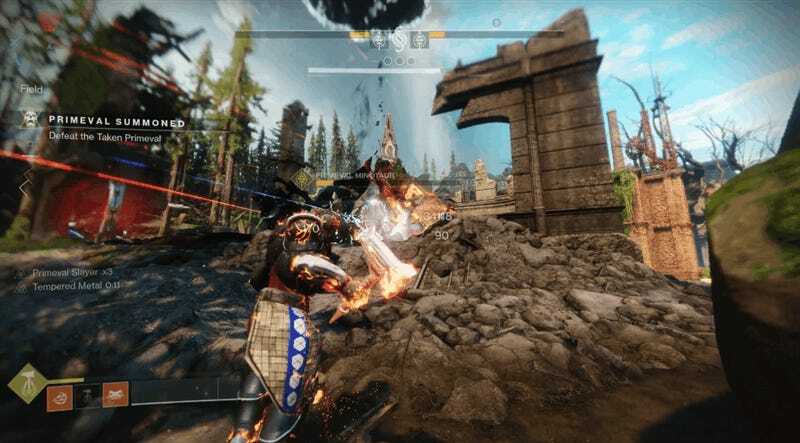 When someone invades in Gambit, they’re usually immediately put into a four-on-one situation where the numbers are against them. To make up for that, they get a number of bonuses. For starters, they have an overshield, which means you’ll have to knock it down, then knock down their regular shields, then their health. They also have the ability to see the other team through walls, which makes it very easy to set up snipes from across the map. When you see an invasion notification, you will probably immediately feel tense and alert, like you’re being hunted. That’s good, because you are. You can beat an Invader, of course, especially if your teammates weaken them first. Keep an eye on the opposing team’s portal status. As you run around picking up motes, it’s important to keep an eye on the top bar to see if the opposing team has a portal up. Maybe you have 13 motes and are heading to a new area to grab a couple more, which will get you a large blocker. However, when you look at the top bar, you can see that the opposing team just got a portal up. What you do next is a gamble: if you want to go for the next two motes, there’s a high chance that an Invader will turn up as you do so, and if they kill you, it’ll set your team way back. If you think your team can handle the Invader, by all means, keep going. But it’s often safest (and smartest) to go bank your Motes instead of giving an Invader the chance. Remember that Invaders can see your Mote count. Another thing to keep in mind any time your invaded is that not only can the Invader see your location in their UI, they can see how many motes you’re carrying. If you get Invaded while running around with more than ten motes, it’s a safe bet that you’re going to be in the Invader’s crosshairs before too long. If you’re smart, you can actually use that to your advantage, and set a trap for the Invader in an enclosed space. Nothing says “what’s an overshield?” like a shotgun to the face. Coordinate your heavy ammo pickups. Enemies drop heavy ammo in Gambit, but there’s also a heavy ammo pack on a cooldown timer near the bank. The initial countdown should unlock the ammo right around when you open the portal for the first time, so it’s usually smart to leave that ammo for the first Invader to grab on their way over. Choose the best gear for your role. Obviously, you’re going to want slightly different loadouts depending on what you’re doing. It’ll be a while before the best weapons in Forsaken make themselves known, so I won’t even bother giving specific loadout advice based on the year-one weapons I used during the free trial. Just take the time to talk through the weapons you’re using with your team, and make sure you have a combination of things that can deal with every eventuality. Also, even if you’re not going to be invading, it’s a good idea to have some sort of counter-sniping long-range weapon to deal with any Invaders that might show up in your arena. Kill your Primeval Envoys first. When you summon your Primeval, it’ll pop out onstage alongside a pair of “Envoy” backup singers. Aim for the Envoys first. Killing one will give your team a stacking “Primeval Slayer” buff that greatly increases the damage you do to your Primeval. It’s technically possible to whittle down your Primeval without taking out the Envoys first, but it’s much faster if you focus fire on one Envoy, then the other, and only then shift your focus to the Primeval. Don’t invade too soon after they summon their Primeval… or too late. Once both teams have begun their Primeval phase, you’ll both start to get regular Invasion portals. Invading and killing members of the other team heals their Primeval, so try to be judicious about when you go across. If you pop out before they’ve even damaged their Primeval, you could wipe their team but you won’t actually walk back any of their progress because their Primeval won’t have taken any damage yet. This one was a heartbreaker. Conversely, if you wait too long, they’ll be able to melt their Primeval before you can kill anyone to heal it. During the free trial, Primevals went down pretty quickly, so for now, err on the side of going over too early. It’s possible that Bungie will adjust the balance of the Primeval section of each match by adding some health to each Primeval, which will make Primeval fights last longer and allow for more strategic invasions during that phase. Unless that happens, though, be mindful of the fact that Primevals can go down fast. Don’t invade while carrying Motes! In the heat of the moment, it’s possible to forget you’re carrying unbanked Motes before you invade. Don’t do that! Unless you survive the entire Invasion without dying, you’ll lose those Motes upon death. Thanks to Destiny 2’s updated weapon system, sniper weapons are more viable than they’ve ever been. Long-range guns are super strong for invading as well as for countering Invaders, since it’s so much easier to get a bead on people when they’re in the heat of a chaotic fight. Snipers, linear fusion rifles, or higher-end stuff like the Sleeper Simulant all work great for taking on other players, and Forsaken will doubtless introduce a bunch more weapons that work well. Generally, though: fighting at range is the way to go. Always grab bounties before you play. One of Destiny 2's most throwback-y changes is the return of vendor bounties for every major type of activity. 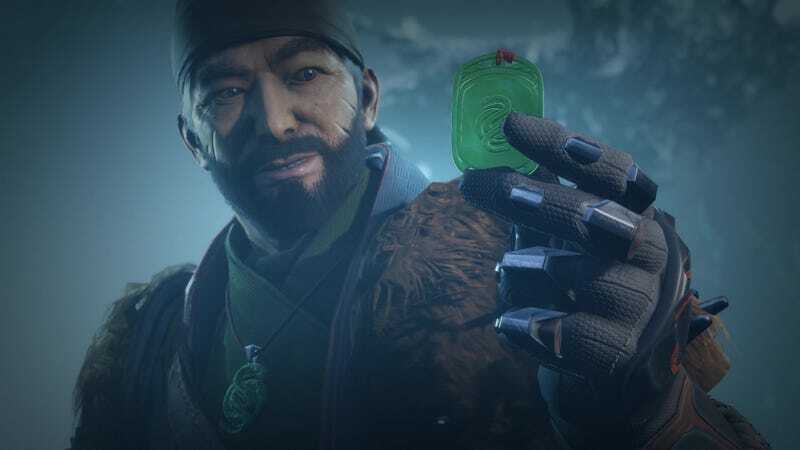 Gambit bounties reward you with Gambit reputation (“Infamy”) and can get you gear from the Gambit loot pool, so it’s a good idea to pick up the weekly and daily bounties from the Drifter before you play. That means you’ll have to visit the Drifter in the Tower, and that also means that sometimes you’ll forget, then remember halfway into matchmaking, and curse yourself, and feel annoyed. It’s still worth going and getting them. Those are my basic tips, which should help you get started with Gambit. I’m sure that more advanced strategies will emerge over the coming days and weeks, and I’ll share those as they develop. See you out there.